Believe it or not, it wasn't Mr. K's charm that won me over the night I met him. No, in fact, that charm we all have come to know and love didn't come out until I brought him home. 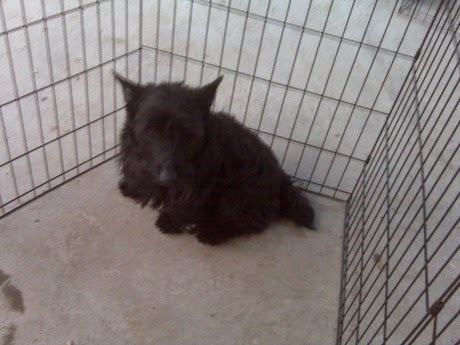 The night I found Mr. K at the shelter, I don't even think I knew he was a Scottie at first. I remember being surprised when I read his bio and it said he was a Scottish Terrier. His hair was so overgrown and he wouldn't lift his head from the ground or look at me - no matter how many times I came back to his little cage or how long I stayed with him. One things was certain: this boy was too sad and he deserved a chance at happiness! The next night, I came back to pick him up. He seemed to recognize me but was cautious showing any hint of excitement. The minute that leash was on and we were walking to the car, though, it was like life had been infused into his little body. He sat in my lap the whole drive home, occasionally looking out the window. That first night, he slept in the kitchen with a baby gate up and in the morning, I took him to A Dog Eared Corner for a day of grooming and doggie daycare. When I returned to the shop and saw Mr. K again, I couldn't believe my eyes. I didn't even recognize him...in part due to his hair cut and in part due to his confident nature. My coworkers (who joined me at lunchtime to meet my new furry friend) laughed and cooed over my handsome puppy. 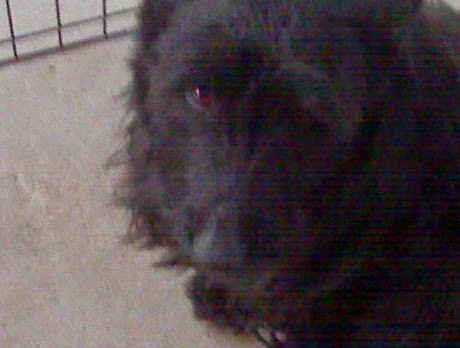 Less than a day into his adoption trial period, it suddenly became very clear that a Scottie Mom was born. Wow! what a difference and in such a short time. He must have recognised you as a soul-mate. Your wonderful story has put a smile on my face and a flutter in my heart! God bless you, Scottie Mom and Mr. K.
Mr. k is lucky to have such a wonderful Mom. But then, you already know how lucky we are to be loved by Scotties! Awww made me tear up. Lucky Mr. K, lucky you. Aww, you made me tear up. Lucky Mr. K, lucky scotty mom. MR. K landing in the right place. Amazing story. I can never fathom why someone would give up an such an amazing breed. 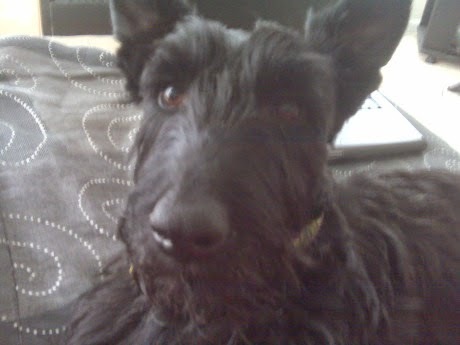 I am smitten with my Scottie and miss her everyday.